And to open another can of worms, I have no problem admitting that I’d rather have a very well made cup of Moccona freeze-dried dark blend – made just right (I have the formula down pat and have trained The Anster so he can turn out a perfect cup of coffee despite never drinking the stuff) – than a poorly made flat white or latte. So I am trying to cut down my coffee from a good day to a bad day in order to get my water consumption up from pitifully little to over 2 litres (and for each cup of coffee I drink, I have to increase my water intake by twice the amount of the coffee). So rather than thinking I drink too much coffee, it is that if I drink 4 cups of coffee a day, that makes 8 cups or 2 litres extra of water a day that I have to drink. And it isn’t drinking all that water that is the problem so much, it is the continued trips to the ladies room. My boss will start deducting time from my pay if I continue with two toilet stops per hour. I am hoping I train my bladder to the increased water consumption so that it can handle more than a thimbleful at one time. So, I can hear you saying, what in the world has coffee got to do with apples. And that is a good question. After much pondering about why I drink coffee, other than the fact that I really really like it, is that I often want a hot drink, not necessarily coffee. So that got me thinking about the different hot drinks I could have instead of coffee. And that is where the apples come in. I was testing the different apple syrups and had poured each into the little egg cups to see the different colours etc. So when I had finished the photo shoot I had option of trying to pour the syrup back into the bottles, tipping it out (a big “reduce, reuse, recycle” no-no) or using it some how. About that time I felt the need for some refreshment so I put some apple syrup (a mixture of two of them – not sure exactly which two only that it wasn’t the appelstroop as that plopped nicely back into the pottle) into a cup and topped it up with freshly boiled water. 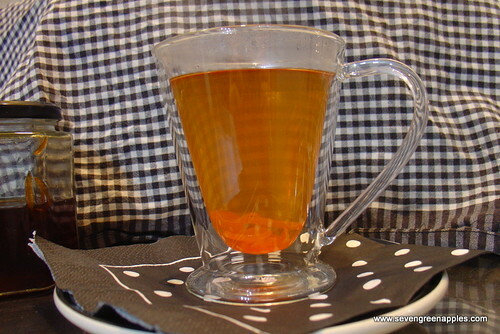 Et voila – hot apple drink. It is super yum and a nice change from blackcurrant juice or lemon and ginger. As I was walking across the living room with my lovely glass mug of hot apple juice I had two kids asking what it was and why I hadn’t made them any. I can see that another batch of spiced apple syrup will soon be in order. 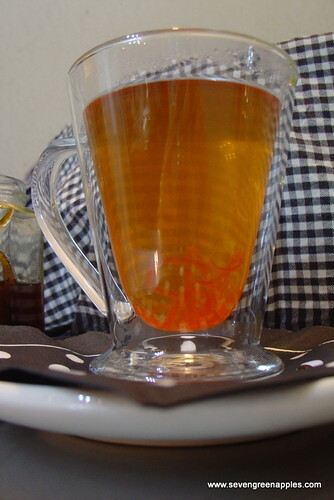 Place syrup into a mug and top up with freshly boiled water. Allow to cool a little before sipping your way through the beautiful amber liquid. This entry was posted in Drinks and tagged hot drink, recipe, Spiced Apple Syrup by Jo Dohrman. Bookmark the permalink. Thanks to Vicki at Dante Fine Foods, it was cinnamon I was using – just not fine Ceylon cinnamon. I sometimes make a hot apple drink with Celestial Seasonings Apple Spice tea, a cinnamon stick, and a few Werther’s hard caramel candies (which dissolve into the hot tea) or some caramel syrup. It’s delicious and very cozy for a cold autumn or winter day. That sounds interesting – will try this and see how it tastes.